Wed., Sept. 2, 2015, 7:21 a.m.
A GRIP ON SPORTS • The most talked about guy at Eastern Washington football practice yesterday was a guy who wasn’t even there. I bet that went over well with the Eagles. Read on. • You are the starting quarterback of a college football team, a spot you just won after the departure of one of the most prolific quarterbacks in school history. You are preparing for the season opener. And a guy walks up to you wanting to talk about the former starter. It can’t be fun. Or well received. Yes, it was seven years ago now when I asked Gary Rogers about replacing Alex Brink at WSU, but I could tell then Rogers wasn’t enamored of the thrust of the conversation. The questions had to be asked, sure, but they hit a raw spot. So I made sure to finish the first major interview I had with Rogers with other, non-Brink-related questions. And then thanked him for his time and understanding. The whole conversation came back to me today as I read Jim Allen’s story and blog post on Eastern’s Tuesday practice, with Vernon Adams the No. 1 topic of discussion. And then I read Austin Meek’s story in the Register-Guard about Jordan West, the guy who is replacing Adams in the Eagles’ starting lineup – though replacing isn’t probably the right word. West is the starting quarterback, that’s a given, back problems aside. It’s just that he’s not Adams, one of the most eclectic quarterbacks in college football. Adams made plays for the Eagles with his feet. He made plays with his arm. He made plays with his presence. But now he’ll be making those plays for Oregon, which just happens to be Eastern’s opponent this week. West will be the guy in charge of Beau Baldwin’s high-powered offense. And he will run it a different way. We saw that last year, when West filled in for an injured Adams and led the Eagles to four consecutive victories. Well, he should have, He played well enough for that. The one loss, at Northern Arizona, was more on the defense, the defensive backfield to be precise, than West, who did his job. It’s the way he does his job that is the biggest contrast to Adams. Either that, or their body types. West looks like the prototypical quarterback, all of 6-foot-4 and 220 pounds. He can make all the throws and, if he’s 100 percent healthy (he missed some time last week with a balky back), he can move better than you might think for a guy his size. He’s not Adams, a shifty 6-footer (or so). Fine. When it comes to making certain throws, West may actually be better. And if you know anything about Baldwin, you know his offense will be tailored to getting the most out of his quarterback’s talents. He did it with Bo Levi Mitchell. He did it for Adams. And he will for West. Thanks to that, he won’t have to replace Adams. He’ll just have to be the best Jordan West he can be. It may not matter this Saturday – the Ducks are one of the most talented groups in the nation and all the other crud be darned, they are the better football team – but it will matter next week in Iowa and the weeks down the road. By then, maybe, the questions about Vernon Adams will have stopped. Maybe. • WSU: Speaking of the Cougars, they are playing Portland State, the school that ended Rogers’ short stint as WSU’s starting quarterback. If you don’t remember, Rogers and his backup Kevin Lopina, were both carted off the field during the 2008 game, both suffering back injuries. It was ugly and we’re not talking about WSU’s 48-9 win. The starting quarterback this week will be Luke Falk, a decision Mike Leach revealed yesterday. Jacob Thorpe has that news and more in his weekly Pac-12 notebook. He also has his Pac-12 power rankings, a blog post with practice notes and video interviews of Leach and defensive coordinator Alex Grinch from after practice. Finally, Jacob has a morning post with links. ... Coaches seem to be keeping their starting quarterback under wraps this year. ... ESPN.com has quite a few WSU mentions to pass along, including one about Leach’s continuing influence on Big 12 offenses, the Washington State player with the most to prove and a piece on the Pac-12 teams' openers. ... Jon Wilner rates the Pac-12’s best all-time football teams. I disagree with his final three. The best team I’ve seen, in relationship to its competition, was the 1972 USC group, which was slightly better than the 2004 Trojans. The 1991 Huskies were great but weren’t even ranked No. 1 by one of the wire services. And, yes, I know they probably should have been. But there was still a doubt and there was no doubt about the 1972 or 2004 USC teams. • EWU: We linked Jim's pieces above, but here’s another to his story and his blog post, just in case you missed them and don’t want to scroll back up. ... There is also a Oregon notebook in the Register-Guard with a lot about Eastern in it while the Oregonian has this piece on Cooper Kupp and another on Adams. • Shock: The Shock made official yesterday what everyone has known for a while: They are leaving the Arena Football League for the Indoor Football League. Jim Meehan covers the news with this story while John Blanchette examines the ramifications of the move in this column. • Indians: Trailing by five runs in the seventh inning, the Indians rallied for 7-6 victory over Everett at Avista last night. Chris Derrick has the game story and a blog post on the big comeback. 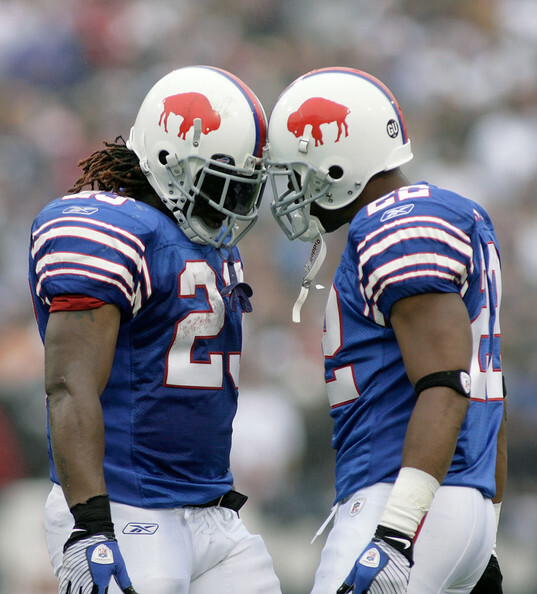 • Seahawks: With Robert Turbin suffering a “significant” high-ankle sprain the other night, the Hawks brought in former Buffalo Bill Fred Jackson (pictured with a former teammate, Marshawn Lynch) for a physical. Nothing has been decided but there is speculation the team will try to sign the veteran running back – and Lynch friend. ... Tom Cable is excited about the offensive line and thinks it can be really good. If it is, give the man a raise. ... Pete Carroll talked about a lot of subjects yesterday as did Russell Wilson. ... Wilson is on the regional cover of Sports Illustrated. • Mariners: Thanks to a late two-run home run from Logan Morrison, the Mariners were able to pull out a 7-5 win at Houston last night. ... The M’s called up four players as the rosters expanded yesterday. ... The M's rotation may be tweaked a bit. • Sounders: National team duty is cutting into most every MLS squad, as the league doesn’t respect the international window as does most leagues around the world. ... Seattle seems to have suffered a lot of hamstring problems this season. ... It isn’t hamstrings that kept a pair of Sounders on the sidelines yesterday, however.